When looking for quality/size/value upgrade to your audio setup, bookshelf speakers offer the most bang for the buck. Because the market is packed with different product, finding the best bookshelf speakers can seem pretty daunting. But, we’re here to help you – let’s get started! Bookshelf speakers are the foundation of the audio setups around the world. Often placed on shelves or other raised surfaces (therefore earning the name), these audio components provide strong, distinct sound for any audio media. Because of their versatility, they can fit the most audio players and amplifiers, and provide the most value. The standard bookshelf speaker usually comes as a two-way setup, containing a woofer and a tweeter. The former produces basses, and the latter produces the high-frequency tones. There are variants with a third, midrange driver, but not as often. This addition improves the performance by covering the midrange sound. This makes the job easier for the tweeters and woofers. When looking at the drivers themselves, you should note the size, wattage, and impedance of both woofer and tweeter. There can be differences in specs that manufacturer states and the realistic features of each component. Next, there is the cabinet design: speaking of this feature, you can have sealed, rear-ported and front-ported speakers. This relates to the location of the air vents in the speaker box, and it has a bass resonance function besides leading the air out of the speaker. The rear ported speakers usually have more energy in low-frequency sounds and much more bass, which makes them much better for the electronic music. 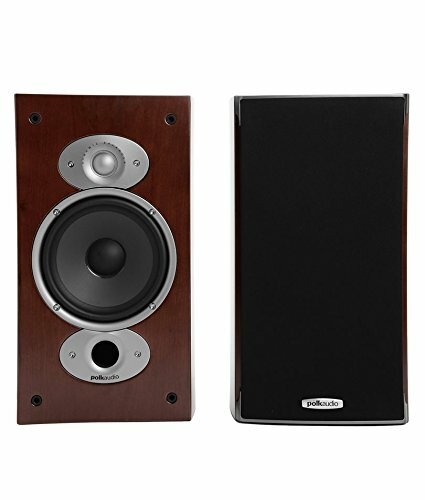 These speakers usually shouldn’t be placed with rear side backed up to a wall, or in corners. The front port speakers are created to solve the placement problem. Those usually feature similar performance as rear port speakers, but they tend to produce upper harmonics distortions. The sealed speakers, as the name implies, don’t have any exhaust hole. These models usually utilize the mechanical components to handle the air and membrane movement, resulting in superb higher-frequency sound. On the other hand, they don’t have enough bass as the other two types and are prone to issues when placed near a wall. There’s a common “The Bigger, The Better” belief that isn’t as true anymore. The standard bookshelf speaker can be quite bulky and robust, but don’t let the size tricks you. The physical size might be an advantage in the air handling and bass resonance, but only to a certain point. Everything beyond this point (when the difference between the drivers’ sizes and the casing itself is in ratio bigger than 1-3) will make a dull, low-quality sound. The size of a speaker is usually based on the drivers included – the more drivers inside, the more space required. On the other hand, you should inspect the room you’re setting up with audio components, so you don’t buy an over-sized speaker that will blow everything out of proportion. Both of these systems require different components and utilize different placement of speakers. 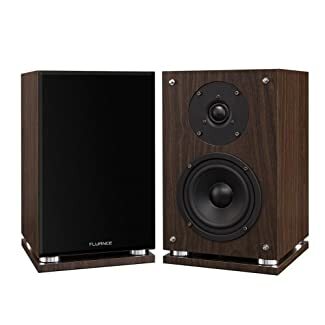 The standard stereo system is used more often when utilizing bookshelf speakers, although they can be utilized in multi-speaker systems as well. As the accessories are concerned, you can opt for various speaker stands, wall mounts, ceiling and cables of different length to match your own design. The frequency response describes the range of sound frequencies (from the highest highs to lowest lows) that a speaker can produce without problems. 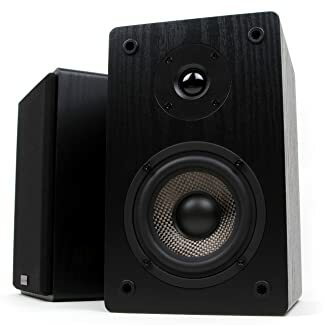 The balance between highs and lows is usually ranging from 40 to 20,000 Hz, and your average bookshelf speakers will probably be in this range. Depending on your budget, you should look for better low frequency if you’re spending more money, and better high frequency sound if you’re on a budget. Everything that goes beyond 40-20,000 Hz range in both lows and highs usually costs a lot more. Impedance measures how much resistance a speaker encounters while receiving an audio signal, and is measured in ohms. This feature is important when pairing the speakers with an amplifier. The average impedance of bookshelf speakers is 6-9 ohms. Voltage sensitivity gives the information how loud the speaker is when paired with specific input – anything with at least 86 dB is good. Power handling brings the info about your speakers that explains how much power (in watts) the speaker can handle before experiencing issues like distortion, etc. 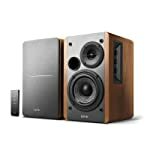 R128OT is a stereo system with two bookshelf speakers enclosed in solid wood, with gray speaker grills that are detachable and a very good sound. The speakers are front ported, and the air flow is excellent. The real wood is used for the enclosure, which can be felt in touch and when weighing – they are around 10 pounds. They are 6.9 inches tall, 4.7 inches wide, and 5.7 inches long each. The controls are on the right side of the right speaker, and they enable you to control the master volume, bass, and treble (-6 to +6 dB). They are built of solid plastic and turn nicely. A fine addition to room audio setup is the small remote controller bundled in the package. On the back of the speakers, you can see the connection panel, where you can easily differentiate the active and the passive speaker. The right speaker is the active one. You get all the power and audio cables as well. The frequency response is 75 – 18,000 Hz and the input voltage ranges from 100 to 240 volts brings a decent power. The woofer included is 4 inches, and its impedance is 6 ohms. Tweeters are of 0.5 inch and 4 Ohms. When looking at power handling, these bad boys can handle 21 watts per speaker, which can bring some serious loudness. 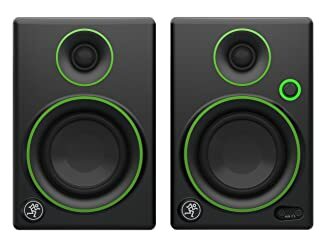 One of the world leading manufacturers of studio monitors, Mackie, brings the new CR series with beautiful matt design and black & neon green color combination for unique appearance. The CR 3 comes with 3-inch polypropylene-coated woofers, 80 – 20,000 Hz frequency response, 120-volt input limit, all packed in matt black boxes with neon green details. The CR3 bookshelf speakers are 8.5 inches tall, 6 inches wide, and 6.5 inches long each, and they weigh around six pounds combined. They aren’t that big as you can see, but they pack a solid punch for their size. Out of the box, they feature a standard, woofer-down-tweeter-up design, with one volume knob that serves as an on/off button with light green illumination. The 1/8’’ input is located on the front, enabling you to connect your smartphone or another mobile device, and headphones as well. The speakers are made of solid wood, and are rear ported, enabling a fine airflow and resonating bass energy. As on the other speakers in this class, one speaker is passive, and one is active; the former has the amplifier installed and brings all the necessary inputs. CR Series 3-inch speakers are definitely worth the price and a fine audio gear for any environment. Here’s something that looks really interesting – a set of speakers from the less-known manufacturer on the market, Fluance. SX6W bookshelf speakers come as a response to market demands, with the accent on size, quality, and power. When we talk accent on size, we’re talking about it for real – these speakers are big. Each speaker is 13.5 inches tall, 8.3 inches wide, and 9.1 inches long, and weighs around 11,6 pounds. Compared to other models reviewed today, these bad boys look more robust and massive. First, you’ll notice that SX6W speakers are looking contemporary – such a good word to describe the design and build of these speakers. They feature 5-inch polymer-treated drivers and 1-inch tweeters. Let’s get down to tech specs; the rear ported SX6W feature 50Hz to 20.000Hz frequency response, and handle the 30 – 100 Watts range of power. The impedance is 8 Ohms, which isn’t the best out there, as you can agree. The rear port boosts the bass power, which can be felt when you turn up the volume, and there’s no distortion on higher volume, thanks to good sensitivity (~89dB on average 2.80V, which is more than decent), and high-performance magnets called Neodymium used in the tweeters. Overall, if the design & size aren’t cons for you, you should aim to get these, and you won’t be disappointed. The RTI A3 is the speaker set from the well-established Polk Audio company, popular for its wide array of products in the audio industry. The RTI series of speakers is among their most popular product lines, developed since 2008 for the value-for-the-money audio segment. A3 bookshelf speakers from Polk Audio feature a 6.5-inch driver covered with mineral/polymer coating, and 1-inch silk tweeter, the biggest of the today’s compared products. RTI A3 is a pair of big, rear ported speakers enclosed with cherry (or oak, depending on your choosing) wood and designed in a modern teardrop shape. Each speaker weighs around 8 pounds and is sized at 14,75″ of height, 8,6″ of width, and 14″ of depth. Yup, that’s a lot of depth. The front design is modern and combines a nice gray color that goes well with both black and brown. The tech specs of these speakers are decent; the 40Hz – 27.000Hz frequency response ensures the high volume and great deep bass, the 8 Ohms impedance is standard, and the 89db of sound per power input of 100V is more than enough to make your shelves vibrating. RTI A3 are big, good looking and powerful speakers. They aren’t on the cheaper side, but the worth every penny. Brought by Micca Electronics, the MB42 bookshelf speakers bring the almost unbeatable pricing for the standard set of speakers. Let’s see what they bring for the price. First and foremost, the woofer included comes covered with a carbon fiber coating with rubber surrounding. This particular feature enables higher resistance and durability, but packs that distinct aggressive sound in the mid sections. 9.5 inches in height, 5.8 inches in width, and 6.5 inches in length make them medium-to-small sized, and the combined weight is around 8.5 pounds. Not as visually impressive as other speakers we reviewed today, but suitable to fit many places on the other side. If you don’t have much space, these can be your perfect bookshelf speakers. They bring a rather small (0.75”) tweeter that can withstand up to medium volume setting, which sounds surprisingly good paired with carbon fiber woofers. But the quality gets lower with higher volume setting, and it easily makes clear that you can’t expect much power from these speakers. The testing proved the claim; MB42 can perform as much as you can expect for this price range. Still, if you’re on a budget, or want to set an audio system for a smaller room, they might fit well. Totally up to you and your preferences, your budget, and your room. When considering the today’s five speakers, Polk Audio RTI A3 speakers bring the most bang for sure. Looking at the definition of true bookshelf speakers, they score the most points in all categories included. If your space and budget allows them, they are a definite hit. If you want to have a speakers with more quality for your room, the soundbars may be the better choice.